Fry off minced meat and onion. When cooked through, cover with spices, add the peas and mix. Cut each piece of filo into eight square pieces. Spoon a scant tablespoon of mixture into the middle of a pastry square. Wet the edges, fold one corner to its opposite and seal, pressing out any air bubbles. Fold inwards any remaining excess pastry. Add a second layer of pastry, repeating the process above. On a medium heat, heat vegetable oil in a deep fat fryer or wok (fill 2/3). 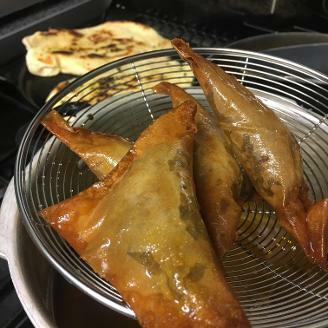 When the oil has reached 180 degrees, drop some samosa's into the oil, being careful not to overcrowd the pan.